April through October marks forest fire season in Ontario. On average, more than 1,000 wildfires burn each year across the province, with about half of them caused by people. Making sure the fire is out before leaving the site. A person failing to adhere to these standards could be fined and held responsible for the cost of putting out the fire. Spreading out leaves if raking them into a forested area. Piles of leaves don't decompose very quickly and if they catch on fire can be quickly carried by the wind. Storing all firewood at least 10 metres from all structures, including decks. Keeping roofs and rain gutters free of flammable leaves, pine needles, and other debris that can be ignited by wind-blown embers. Ensuring firework displays are safe by launching fireworks over an area free of flammable material, such as gravel or a body of water and, when completed, checking the area for any hot residue to ensure it is put out. 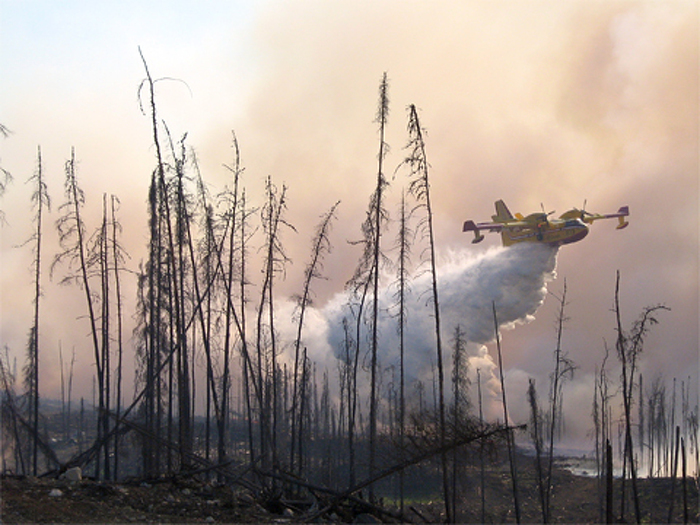 Ontario’s forest firefighting program has more than $42 million in fire suppression equipment, as well as nine water bombers, four helicopters and three twin otter aircraft. Additional contract aircraft are added as needed. In addition to fighting fires in our province, Ontario personnel fight fires in other jurisdictions as needed. Through this reciprocal agreement, when Ontario needs help, other jurisdictions send personnel to Ontario. People are reminded to consult with local fire officials for specific municipal bylaws on outdoor fires. This document was published on April 05, 2016 and is provided for archival and research purposes.